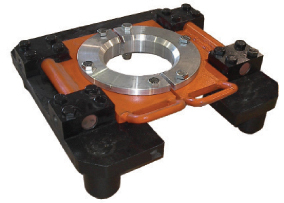 The Den-Con Wear Guide Assembly helps reduce wear on Master Bushings and Bowls during drilling operations, particularly when using a top drive. The Wear Guide Assembly mounts directly in the pin drive locations on 27 1/2" and 37 1/2" Master Bushings. Locking drive pins are optional. The expendable Wear Guide Rings are sized for 6 5/8" and smaller pipe sizes. The wear guide material is designed to minimize any wear to the drill string.